Here are the top 15 puppy supplies you will need to get before bringing home your new Miniature Schnauzer puppy. Be sure to carry the checklist with you while shopping for your new puppy at the store or online. Bringing home a new puppy is so exciting. That cute little cuddly bundle of fur is now your responsibility to care for and love. If you are a new dog owner there are several things you'll need to purchase now to prepare for this little new addition to your household. Feel free to copy and print the puppy shopping list. To do this simply highlight the shopping checklist in the boxed area below. By using left-click on the mouse at the beginning of the list and drag down to the end of the list. While the text is highlighted, go to your top menu bar and click File/Print. Under Page Range put a radio dot on Selection and then click the Print button at the bottom. Another way to print the shopping list is to highlight the text as above and then right click, select copy and paste the info into a word processor. Once the information is transferred, you can print it out or save the document as a file and print the information when you need it. Copy and Print the items in the boxed area below. 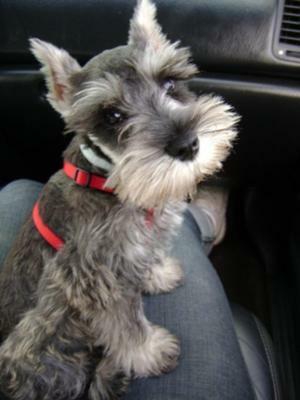 Being prepared at home with the right puppy supplies, will make it that much easier to begin enjoying your new Miniature Schnauzer puppy. 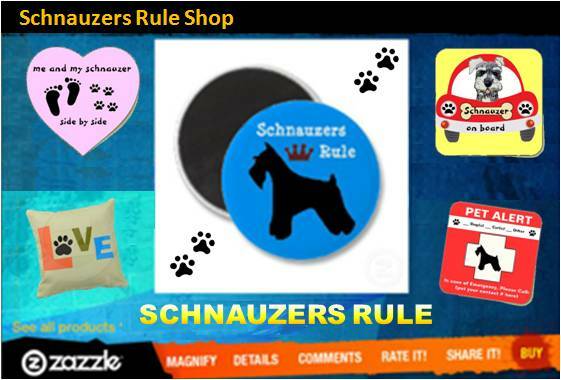 dog shopping tip: If you are going to do some shopping online for your Miniature Schnauzer, don't forget to check out these great Miniature Schnauzer dog offers and check out the breed specific Miniature Schnauzer gifts including the top 10 Schnauzer gifts at the Mini Mania Mall. If you like the ease of shopping online, you can find most everything you need to purchase for your new puppy (and yourself) right on Amazon. Soft Plush Dog Toys are great for delicate new puppies to play with. These particular toys are soft and cuddly, have squeakers, and come in an assorted styles and colors for your new puppy to have endless fun. You might want to get some toys for teething too. Read our tips on buying the right dog toys. North States Pet Gate allows you to section off a room from your puppy. This gate works between railings or walls. Can be used as a swing gate too. You can effortlessly create a barrier for your pet. Unique door sockets give pressure mounted pet gate extra holding power in doorways and openings. A Dog Bed that's super soft to make a great snuggle spot. Help protect your dog from cold floors and summertime heat while providing a soft spot for snoozing. Purchase a dog bed that is both comfortable and durable so it lasts for a long time. Dog I.D. Tags with your pup's name & your contact information. These are some of the best Pet I.D. tags you will ever find. They come with a lifetime guarantee on engraving and materials. Made in the USA and 4 times thicker than the tags you find at big pet store chains or the ones in the machine. Each tag made from a high strength composite alloy with an enamel background in the color of your choice. Food Dish and Water Bowls - This particular food and water bowl set comes has two 8 oz. bowls which are completely removable and dishwasher safe for convenient cleaning. The pet feeder is also collapsible for storing, travel or a day at the dog park. Bowls are BPA free and are antimicrobial. Elevated bowls help for healthy digestion. Wahl Pro Series Pet Clipper Kit - Extra powerful clipper can be used with or without cord for maximum convenience! Easy to snap on and off detachable precision ground high-carbon steel blades. Kit includes: rechargeable cord/cordless clipper, recharging unit, attachment guide combs, pet comb, stainless steel scissors, clipper oil blade, guard cleaning brush, instruction booklet, and styling DVD all in a durable storage case. Puppy Potty Patch - As seen on TV, helps eliminate floor accidents with its specially scented faux sod to attract dogs when it's time to go. The elevated turf drains into the base keeping it odor free. Grate keeps the grass dry and above any liquid. Collection tray holds up to a gallon of liquid allowing multiple uses. At the end of the day simply empty the base into the toilet and clean with soap and water. First Aid Kit; Puppy Care Book; Training Aids; Vitamins and Supplements; Pickup Bags; Dental Products; Nail Clippers or Nail Filer; Preventative Flea & Tick Treatments; Travel Crate; and so on. And of course, you will want to make an appointment with a Veterinarian for your puppy to have a wellness checkup and complete all rounds of immunization.